Welsh rocker Mike Peters is joining forces with a medical supergroup to say thanks to health staff who are treating him and his wife Jules for cancer. 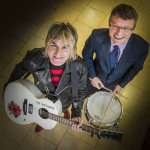 The Alarm frontman will take to the stage at Venue Cymru on November 16 to perform as The Betsi Blues in front of 350 Betsi Cadwaladr University Health Board (BCUHB) staff and VIPs. The performance will be the finale of the BCUHB staff achievement awards, when the winners of 15 categories will be announced, with each handed a glass trophy to honour them for their work. Among the patients, volunteers, board members and charity workers presenting the awards will be Mike, who co-founded the global rock ‘n’ roll cancer charity Love Hope Strength Foundation, and is battling cancer for the third time. The singer, who first beat cancer in 1995 when he was diagnosed with lymphoma, was diagnosed with chronic lymphocytic leukaemia in 2005 but following treatment at Ysbyty Gwynedd in Bangor the condition was in remission – until it returned last year. Last month Mike’s wife Jules, mum to the couple’s two sons, revealed she has breast cancer and undergone two operations to remove lumps, followed by chemotherapy. Mike said: “I am looking forward to playing at Venue Cymru – I’ve played all over the world with all sorts of musicians but never with a group of medics! “This my chance to say thank you to the medical teams that have looked after me and are now looking after my wife. “They all do great work in keeping people like me and Jules alive and so giving our families a future. He is keeping the set list a secret until the event, but has promised to play Love Hope Strength, the song he penned to fund-raise for his charity. On the night he will be presenting the Hadyn Hughes Oustanding Contribution to Work Award. The three shortlisted for the award are Health Care Support Worker Mel Dickinson from Flintshire Community Mental Health Team; Community Learning Disability Nurse Ann Watson from the Adult Mental Health Team in Mold and Dr Ewa Turczanska, Dermatology specialist at Ysbyty Glan Clwyd in Bodelwyddan. Gary has drummed since the age of 11, and plays in a band called The Persuaders with his brother Gordon as well as in band Plural Tap with medics from hospitals on the Wirral. He cites as his drumming idols The Who’s Keith Moon plus Steve White, sticksman for Paul Weller. The musical BCHUB medical group also includes acute care hospital consultant and Bangor University lecturer Chris Subbe plus Ysbyty Gwynedd intensive care unit consultant anaesthetist Chris Thorpe, and they have previously performed at another health board event for staff. 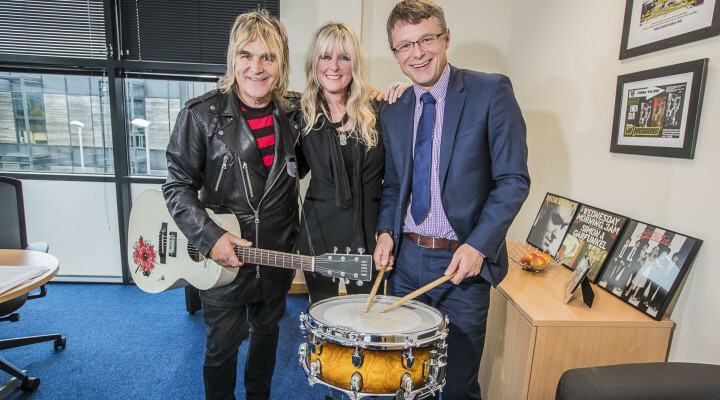 Gary, who took up his post as BCUHB Chief Executive in spring, joked: “This will be the most famous gig I will have ever played! The awards ceremony, which will involve a three-course meal plus live music, will be attended by 350 health professionals, members of staff and guests including BCUHB board members, volunteers and representatives from the Community Health Council. The health board received more than 100 nominations across the 15 award categories. Entries were judged by a selection board comprising Gary plus Chairman Dr Peter Higson, Director of Workforce and Organisational Development Martin Jones, Independent Board Member and former midwife Jenie Dean and Director of Finance Russ Favager. Gary added: “Improving our support to staff is one of the key objectives for myself, as Chief Executive, and the Board. We believe these awards will help to show how much we value our dedicated colleagues across the organisation. “It was wonderful to read all the nominations, which have come from colleagues and from patients. It was a difficult task to shortlist three for each award – and even harder to decide on the winners.